Problem: A New England-based medical device manufacturer required a deionization polishing system to supply 120 GPM of deionized water throughout their facility for multiple applications and points of use. The polishing system was fed by an existing RO system. Solution: Atlas designed a customized solution that includes duplex pumps, redundant PLCs, 42 CUFT “Jumbo” deionization tanks, disinfection and TOC reduction UVs, a 1000 gallon storage tanks and 0.2 micron absolute-rated final filters. The storage tank includes a nitrogen blanket to maintain optimal resistivity levels. Equipment was pre-piped and skid mounted prior to delivery to the site. Atlas’s technicians completed all necessary piping and connections on site in order to connect the system to the existing loop piping. Problem: A Boston-based R&D organization required RO water to feed humidification equipment at a few points of use. Solution: Atlas engineered a custom RO-based solution to deliver ~5 GPM of RO water to a few different humidification units. The system is driven by a bladder tank that supplies constant pressure to each humidification unit. Pretreatment through RO and distribution was pre-fabricated at Atlas and installed on site. Problem: A Boston-based pharmaceutical company required a high purity water system to deliver USP purified water to two separate loops. The company sought a turnkey supplier to install both a custom high purity water system and loop piping. Solution: Atlas High Purity Solutions engineered a custom high purity water system to meet USP purified water specifications. Atlas provided a turnkey solution with loop piping and recirculating faucets at multiple points of use. Atlas also provided a take-off point for recirculating RO water for less demanding applications. The custom solution features Atlas’s containment system and leak detection shut-off valves. The system was pre-assembled at Atlas’s facility in Braintree, MA and assembled on site. Problem: A premier life-sciences company located in greater Boston required varying water qualities for multiple applications. Reverse Osmosis (RO) water was required for stability chambers while ASTM Type 1 water was required for laboratories. The company desired a single solution for both applications. Solution: Atlas designed a custom high purity water (RODI) system to supply both RO water for the stability chambers and ASTM Type 1 high purity water for lab applications. 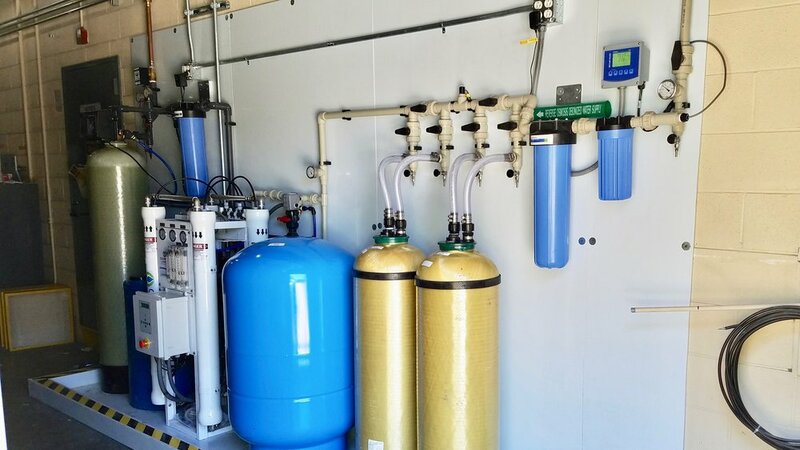 The system is driven by a single RO system and features monitoring equipment from Thornton/Mettler Toledo, UV from Aquafine, and other equipment from the industry’s top manufacturers. The Atlas system has containment and features leak detection/shut-off to prevent emergencies. Atlas engineered the custom high purity system in 3D to meet the specific requirements of the company’s desired location. Problem: A premier Boston-based advanced manufacturing firm required a water system to deliver ASTM E2 water quality for product manufacturing. The customer also required a distribution system to deliver water to multiple points of use throughout their facility. Solution: Atlas designed a custom high purity water system to deliver ASTM E2 water quality throughout the customer’s manufacturing facility. 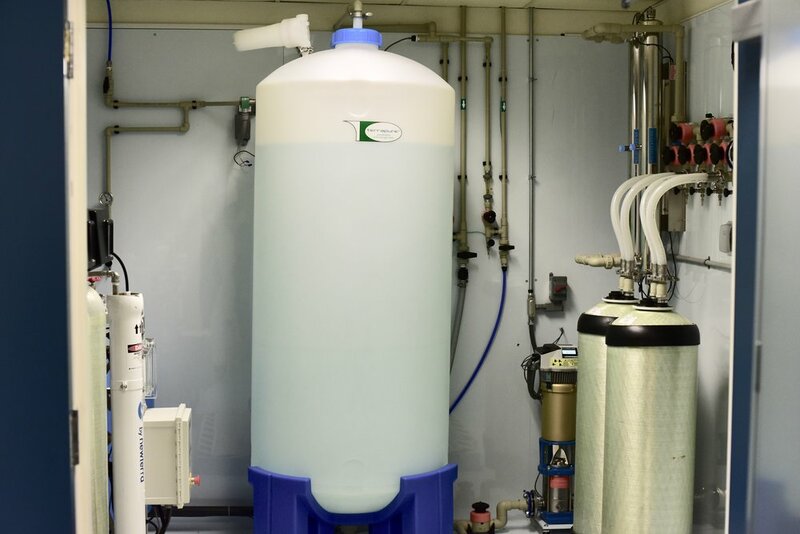 The system includes pretreatment, reverse osmosis, deionization and UV for TOC reduction. 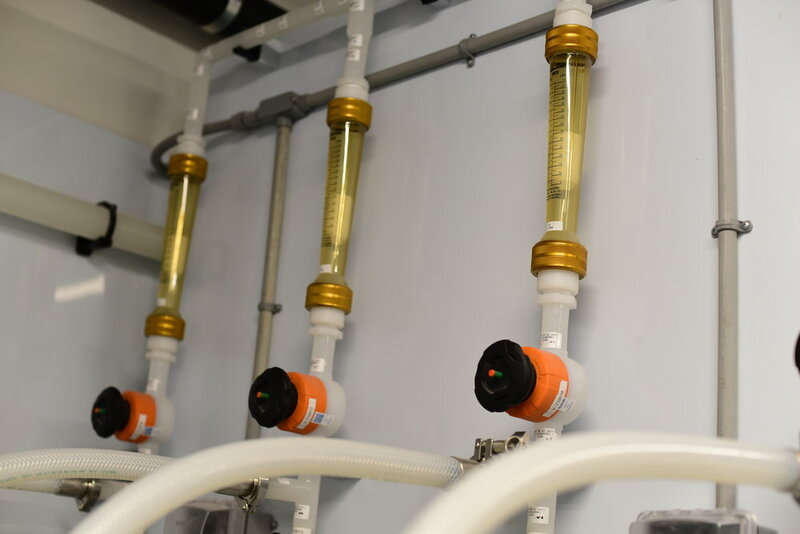 The system feeds two separate storage tanks for additional capacity. 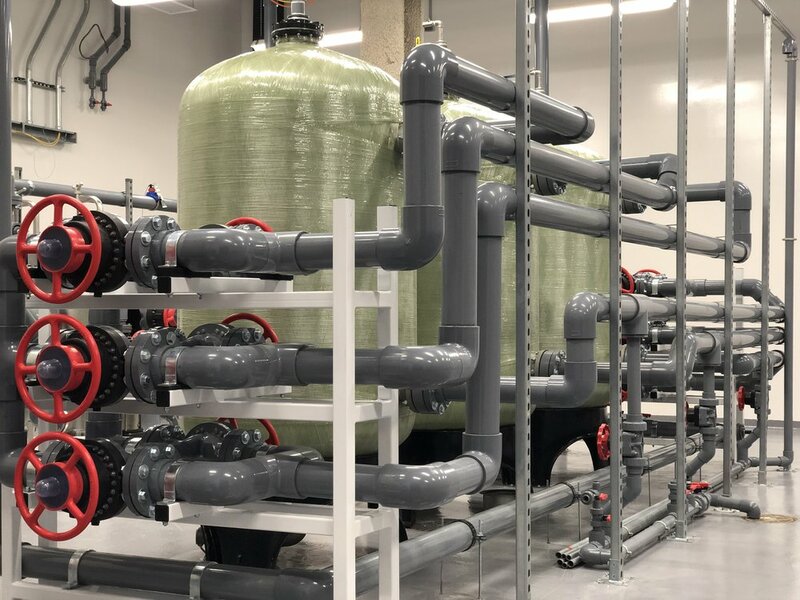 Atlas’s solution was truly turnkey and included all distribution piping throughout the facility as well as all electrical connections to the equipment. Problem: A Boston-based pharmaceutical company required low flow rates of ASTM type 1 water. The company also required the system to provide RO (non-RODI) water for stability chambers. Loop flow rates of ~1 GPM were required. Solution: Atlas’s HydroPass® was the perfect solution. Offering a compact footprint and serviceable layout, the solution provides approximately 1 GPM of ASTM type 1 water. It also delivers RO water directly to stability chambers if required. Non-proprietary consumables ensure that total cost of ownership is kept to a minimum. HydroPass® systems are assembled at Atlas’s Braintree facility and are installed and started-up in a single day. Problem: A southern New England-based Pharmaceutical company required ASTM Type 1 water for laboratory applications. Low flow rates at multiple points of use were required. The company desired a turnkey solution from high purity water generation to distribution. Solution: Atlas’s HydroPass® system was a strong match for this customer. The system provided just over 1 GPM of ASTM type 1 a water. Atlas’s expert staff includes licensed plumbing contractors that completed the loop installation. Recirculating faucets were provided at each point of use. The system includes leak detection shut off valves and containment. USP Purified Validated Water System for Midwest-Based Pharmaceutical Co. Problem: A Midwest-based pharmaceutical manufacturer required a USP purified, validated water system for product manufacturing. The group sought a turnkey high purity water RODI system to include loop plumbing to all points of use in the facility. 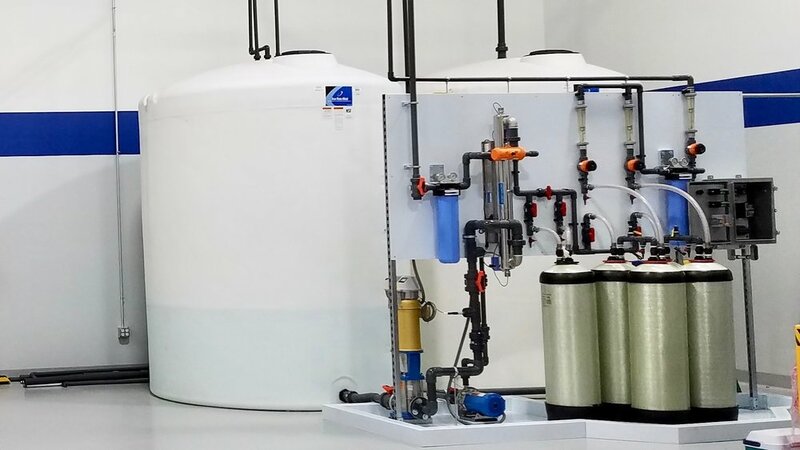 Solution: Atlas designed a turnkey high purity water system that included a 2-Pass RO (reverse osmosis) in addition to deionization, UV, filtration and other technologies. Atlas also supplied the loop and drops for the facility. The system was pre-fabricated at Atlas’s facility in Boston, shipped to the customer, and installed on site. The system delivers the desired water quality. Atlas also supported the validation of the water system.